We may be showing our age a bit here, but we distinctly remember the day the Nissan Qazana concept car was first revealed at the 2009 Geneva motor show. The world’s motoring press flipped their collective lids over its compact dimensions, the sporty SUV styling and motorcycle-inspired interior. We gasped at its suicide doors and tittered at the fact it would never see the light of day. Nissan then proved everyone wrong by releasing the thing in the shape of the Juke (minus the suicide doors) and coaxing a glut of rival manufacturers to copy the blueprint. 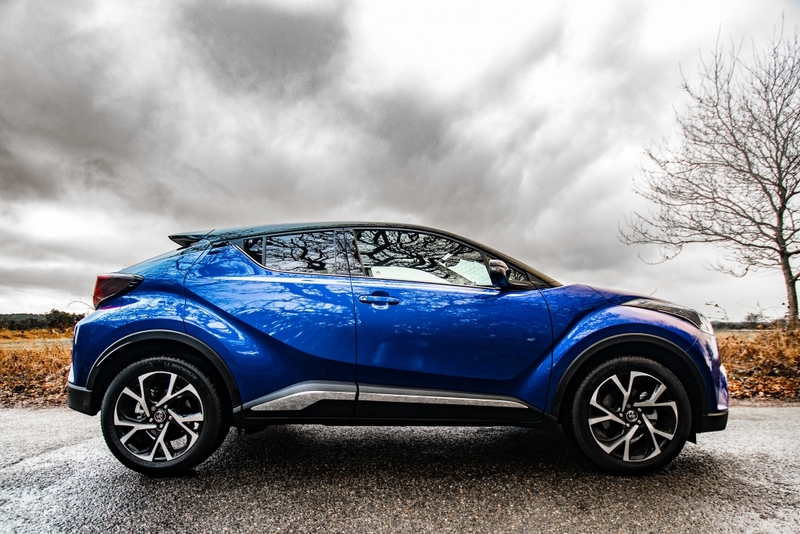 The Toyota CH-R captures a little bit of that Juke spirit: its road-going variant tearing up the rulebook by sticking closely to the jaw-dropping concept upon which it is based. There’s no denying that it makes an impact on the road and its almost cartoonish Manga styling is like nothing else currently on sale. Especially not in the traditionally conservative family SUV market, anyway. It is larger than it looks in pictures (think Qashqai, not Juke rival) and its face bares slashing LED headlamps, gouging air intakes, razor sharp creases and awesome strafing indicators (a bit like the Audi R8), while the rear houses the most striking rear lights you’ve seen in a long time. Toyota and sister company Lexus have long been playing with the advances in metal work by inserting all sorts of shapes and textures into their panels but the CH-R looks like it has been hewn from a precious stone. It’s a sculpture. An architect’s dream. Step inside and the sensory onslaught continues with mottled door cards, which play with the light like a premium whiskey tumbler, and diamond-shaped buttons and dials that have clearly been fashioned purely for this model. 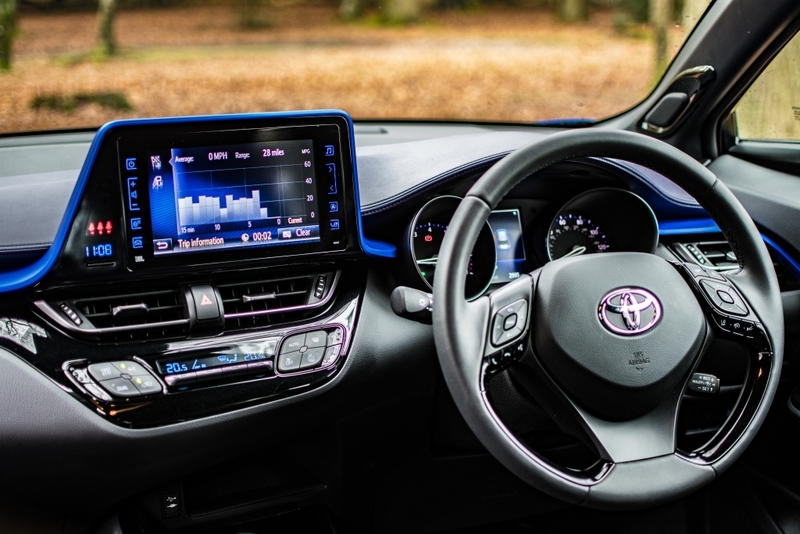 It’s an impressive level of dedication for a mass-market producer like Toyota and even mid-range Excel trim models receive part-leather seats and 18-inch machined-face alloy wheels, as well as touch screen navigation and other niceties. However, the car we had the pleasure of piloting for a week came decked out in the top spec Dynamic trim, which sees a punchy JBL sound system thrown into the mix, as well as a striking 8-inch touchscreen infotainment system. 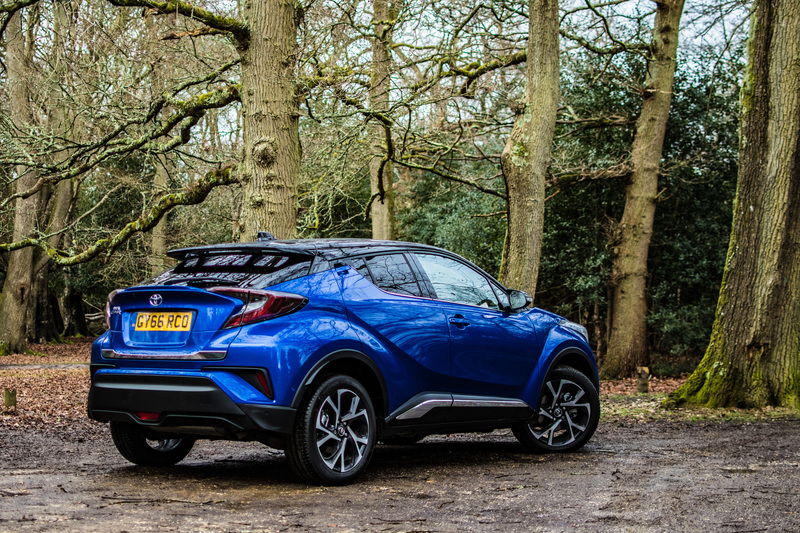 It’s a nice place to while away the miles but the coupe-style exterior does mean the sweeping roofline impedes on rear headroom and the small, tinted rear windows can make it feel a bit claustrophobic in the rear. Although, the upside is that exterior styling remains sharp and true to its Coupe High Rider moniker, with additional neat touches, such as the near-invisible rear door handles, making it look uncluttered, sporty and purposeful. 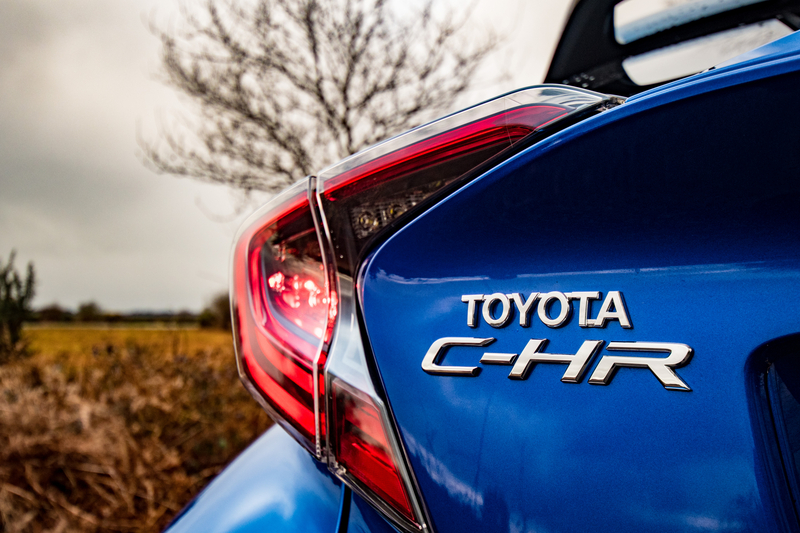 Toyota only offers its CH-R with a turbocharged 1.2-litre petrol engine or a more powerful 1.8-litre petrol. No diesels here, as the Japanese marque favours a hybrid system to eek out the additional miles per gallon and it seems to suit this car’s demeanour. 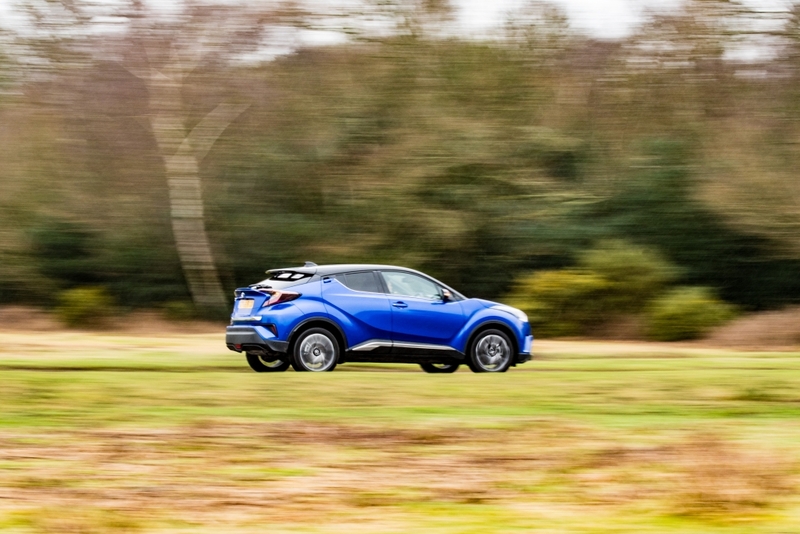 We’re not suggesting for a minute that it’s in any way an adrenaline-pumping experience but the CH-R feels peppy and well planted for a front-wheel-drive machine. Tt does come in AWD variants but it seems pointless unless you live up a mountain. 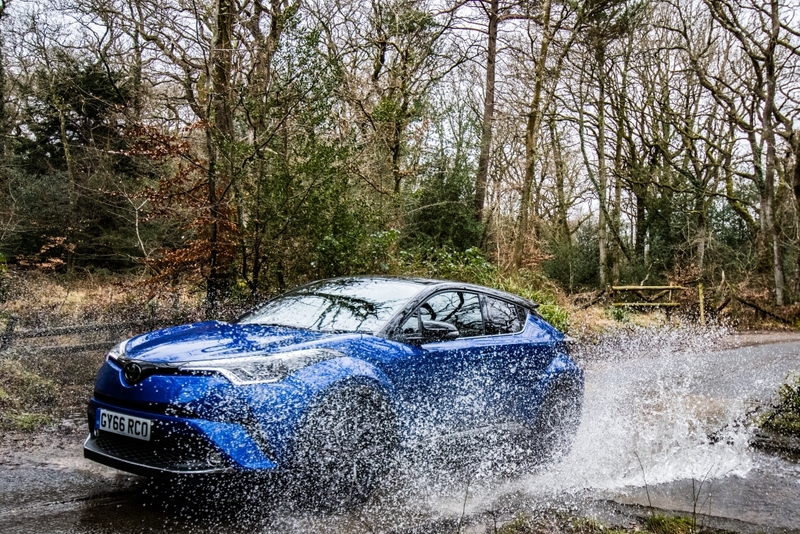 This is partly down to the fact that it is one of the few new vehicles to ride on Toyota’s New Global Architecture, which sees stiffened, multi-link suspension and a low centre of gravity team up to create a fun and lively machine that handles well. Unfortunately, this test car was also specified with the marque’s CVT automatic gearbox and, although it is a good example of a continuously variable transmission, it can still be noisy and is no way near as engaging as a snappy six-speed manual. Still, the punchy 1.2-litre engine does a good job of accelerating up to speed and delivers it power smoothly throughout the rev range. Coast on the motorway and it incorporates lots of engineering trickery to ensure it’s as fuel efficient as possible. In mpg terms, expect to hit in the mid forties if you’re careful with the throttle. Those wanting improved fuel economy should look towards the 1.8 petrol/hybrid variant, as it harnesses electric motors to72.4mpg on the combined cycle and CO2 emissions of just 86g/km. There is also an impressive suite of active and passive safety systems offered as standard. You get blind spot monitors, vehicle stability control, adaptive cruise control, lane departure alert and much, much more. But with all this safety tech comes a great deal of irritation and we nearly put a foot through the infotainment system when it constantly alerted us to a change of speed limit with an irritating chime. To make matters worse, the touchscreen interface isn’t particularly intuitive and navigating settings menus to turn off annoyances takes an age, only for them to return every time the vehicle is re-started. Bugger. 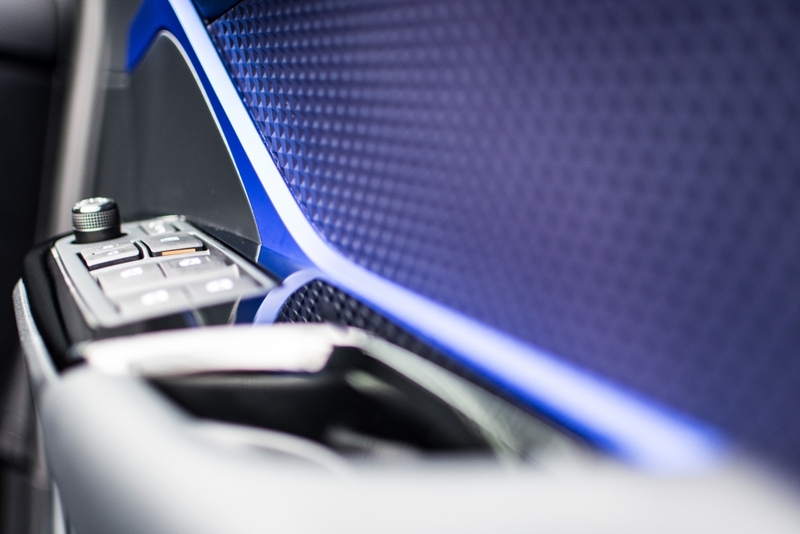 We’re sure the infotainment system merely takes a bit of getting used to but it’s not as user-friendly as rivals from the VW Group, Renault and Nissan, while the interior quarters can feel quite cramped for adults. But these are minor niggles because we like the CH-R. We like the attention to detail. We like the relaxed yet occasionally entertaining drive. We like the fact that fellow motorists stop to have a closer look. But above all else, we like that Toyota is taking some risks.